A British minister has appeared to join growing criticism of US President Donald Trump’s decision to miss a memorial event on Saturday due to rain. Defence Minister Tobias Ellwood took an apparent swipe at the president on Twitter, saying “rain did not prevent our brave heroes from doing their job”. Mr Trump is in France to commemorate the centenary of World War One’s end. He cancelled a visit to a US military cemetery, but the White House said other senior officials went instead. It said the bad weather grounded the presidential helicopter and cited security concerns in hastily arranging a motorcade for the two-hour drive east of Paris. 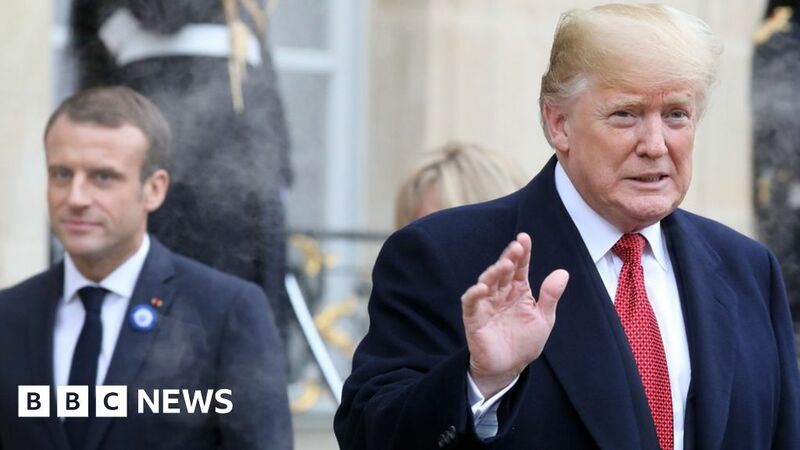 The US president is also opting to miss the Paris Peace Forum, which is run by his French counterpart Emmanuel Macron and starts on Sunday afternoon. The criticism from Mr Ellwood, a former soldier, follows a scathing rebuke from Sir Nicholas Soames, a grandson of the wartime British leader Sir Winston Churchill. The MP tweeted that Mr Trump was not fit to represent the US and said that he was “pathetic [and] inadequate” for not defying the weather “to pay his respects to the fallen”. The US president also received backlash from Americans, like former diplomat Nicholas Burns, who said it was the leader’s duty to honour their soldiers. Ben Rhodes, who served as a deputy national security adviser under former US President Barack Obama, also hit back saying weather was not an excuse. The US president is said to be going to another US cemetery in a Paris suburb on Sunday. Last year, foggy weather caused similar security concerns which prevented Mr Trump from visiting the demilitarised zone between North and South Korea.